The holidays are here! I hope everyone had a great Thanksgiving and Thanksgiving weekend! I surely had a much needed down time with my family and boyfriend. It was pretty much just a chill weekend, nothing too crazy. So for today's makeup look, I'm putting up a warm and festive eye makeup perfect for the holiday parties that you might go to. The bae always asks me why I have makeup on on days that I do, well, the answer is easy, to make me feel good. Sometimes even a little bit of makeup can make you feel, awake and energized to get through the day. 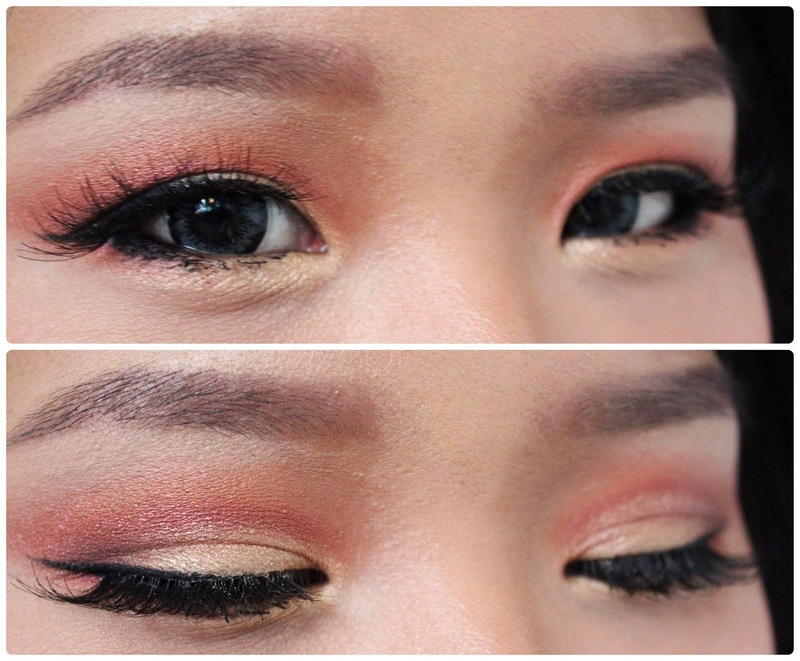 So here's a confidence booster, glam makeup look that will turn heads. Face Shop Lovely Me:Ex Foundation in Medium and Revlon Colorstay Foundation in Medium Beige - Mixing the two foundations for a perfect match, apply it all over the face. Lately I've been using my brushes to apply it on the face evenly and then I go in with a damp makeup sponge to blend out the foundation and concealer for a more natural look and a longer lasting makeup. Maybelline Fit Me Concealer in 25 - Apply it underneath the eyes to hide the dark circles. 3CE Blush Duo in Peach Crush - Swirling a stippling brush on both colors, apply it on the cheeks and blend towards the back, allowing for a slight contour. 3CE Lipstick in Vamp - I went for a plum lip color but you can also go with burgundy, cranberry or deep red lippies. The eyes make look complicated but it's actually pretty easy. I'm trying to use mostly drugstore and Korean makeup for this eye look but of course you can always substitute with whatever you have on hand. Face Shop Lovely Me:Ex Eyeshadow in Toast - Apply it on and above the crease area as a blending/transition shade. This will just warm the eyes and help the other shades blend easier. L'Oreal 24 Hr Infallible Shadow in Eternal Sunshine - With a flat shadow brush, apply this all over the lids. 3CE Blush Duo in Peach Crush - Take the orange shade in a fluffy blending brush and apply it on the crease area bringing it in towards the inner corner of the eye. Go back and forth until it is all blended out. With a pencil brush, take the same shade and apply it on the outer half of the lower lash line. Make sure everything is soft and blended out. 3CE Single Eyeshadow in Saturn - With a smaller crease brush, apply this precisely on the crease also bringing it in towards the inner lash line and slightly bring this shade on the bottom lash line as well. NYX Matte Shadow in Haywire - Apply this just on the outer V of the eyes with a pencil brush to give more depth. L'Oreal Infallible Lacquer Liner in Blackest Black - Use this gel liner to tightline the eyes, as well as line the upper lash line into a wing and connecting it to the bottom lash line as well. Red Cherry Wispy Lashes - Curl the lashes and apply mascara to top and bottom lashes and apply falsies if you want a dramatic look.